Anti-Muslim attacks have taken place across the US every day this week. Islamophobic crime and anti-Muslim rhetoric have been on the rise since the California attacks on December 2. A shopkeeper in Queens was punched in the face last Saturday. A man entered Sarker Haque’s store and looked a newspaper cover featuring the San Bernardino killers. He then asked if everything was free in the store, before punching Haque in the face. “I kill Muslims,” he said. The man continued to beat Haque as he tried to call for help. Haque estimated that the beating went on for seven to eight minutes. A customer entered and held the attacker while they waited for the police to arrive. On Sunday, Denise Slader, a California government correctional facilities worker, threw coffee and an umbrella at a group of Muslims in a California park. The woman ranted at the group, accusing them of being terrorists who tortured Christians. #Islamophobia After praying, this lady approached us and started yelling at us that we're brainwashed for believing in Allah, "Allah is evil" she said. I started video taping her, I ,also, was hit by an umbrella before taking a shower of coffee right on my face. And what happened next was this..
A pig’s head was found outside a building housing a mosque, school and community center in Philadelphia on Monday. The mosque had received a threatening voicemail after the Paris terror attacks. A customer in Salt & Pepper restaurant in New York burst into an anti-Muslim rant, breaking glass partitions and slapping a member of staff on Monday. When one employee, Tahir Mahood, tried to calm Murino down, Murino slapped him. Murino was escorted outside, but returned. He threw a chair through two glass partitions at the counter. Police charged him with attempted assault as a hate crime and criminal mischief as a hate crime. A woman in Brooklyn was kicked and verbally abused on Wednesday. “I can’t wait for the US to get rid of you trash,” the man told her. A second woman was shot at as she drove away from a mosque in eastern Tampa. Also on Thursday, the Council of Islamic Relations in Washington received a hate message and white powder in the post. “Die a painful death, Muslims” the note read. A southern California mosque was damaged in an arson attack on Friday. The fire was reported at the Islamic Center of Palm Springs around lunch time. It was contained to the lobby. The sheriff’s department called the fire an “intentional act” and said it would investigate. 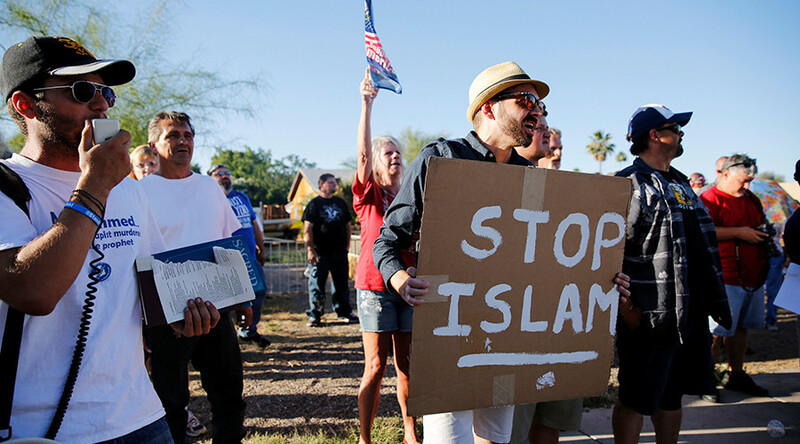 The attacks provide a snapshot of islamophobic attacks taking place around the US in one week. Other countries like Germany and the UK have also reported a rise in anti-Muslim sentiment in recent months.